Theater in the Now: What Happened to Theater Etiquette? What Happened to Theater Etiquette? 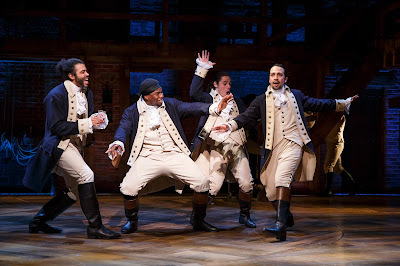 I had the great fortune of finally getting an opportunity to see Hamilton. I felt like I was the only person who hadn't seen it so when the chance for standing room tickets was presented, I jumped on it. At the Richard Rodgers Theatre, you're stuck in the back of the orchestra having to navigate the overhang of the mezzanine in order to see the upper level of the set. But in the back, you also get to witness the actions of those in front of you. At this particular performance, there was a quartet of women who seemed to be celebrating a night out. Maybe dinner and show. I can only assume. They came in just before the show began and seemed to require more time than the average person to turn off their phones. You know, a few minutes into the start of the show. The glow of the cellphone was a bit of a distraction but hey, "we're used to it". Once the show began, all seemed fine. Until about midway through Act 1 when two members of the party had to take a bathroom break. Being in the middle of their row, their exit to the toilet required everyone next to them to get up. And this happened twice. This isn't something new at the theater. It happens. There's some whispering that occurs, but again, nothing new. Intermission comes along and one woman brings the quartet vodka gimlets in Hamilton show cups. It's clear this was not their first adult beverage of the evening. Act II commences and all seems fine until a phone drops during Jonathan Groff’s next appearance. Whispers turn to giggles, and the distraction grows beyond that one row. This continues on as understudy Alysha Deslorieux, who's on for Phillipa Soo as Eliza Hamilton, is proudly singing “Burn”. The couple next to the giggle girls grows furious, a girl from the standing room section ushers the usher to become a hero and quiet things down. And then things get out of hand. When attempting to remedy the situation, the couple begs the ushers, now two, to remove these women. The husband physically forces the two gabbers out of the row, all while Ms. Deslorieux shines on stage. The two remaining woman are upset and make their way out of the row, again forcing the rest of the row to stand. An altercation ensues in the back of the house. Now nearly every back row of the orchestra at the Richard Rodgers Theatre has turned around to observe, and yet Ms. Deslorieux sings proudly on. One of the woman can barely stand up straight as she’s pleading to stay. By the end of the song, the ruckus has died down and we back of the housers give Alysha Deslorieux an extra loud applause. So why is this story important? Because just two weeks earlier, I attended a performance of the incredible revival of Spring Awakening where a young couple, so disturbed by the content, stormed out of the theater during the climatic Act 1 finale. They protested the content claiming it was the most disgusting thing they had ever seen. I attend a lot of theater, most of which nowadays is downtown or Off Broadway. And yet the latest two Broadway shows I attend there are instances where people feel the urge to disrupt not only their fellow patrons but the performers pouring their heart out on stage. There seems to be a string of incidents in big market New York theater of late. The young man who had the urge to charge his cell phone on the set of Hand to God. The cellphone monster that faced the wrath of Patti LuPone at Shows For Days. The drunken fellow who professed his love for Keira Knightly at Therese Raquin. Even that Hollywood actor who attended Cabaret and made a great big scene. And I'm confident there are more that have gone undocumented. No matter where you attend theater, Broadway, Off Broadway, regional houses, there’s always that one person. Maybe it’s that lady in front of you who can’t hear or missed something and asks “What? What did they say?” and a response comes which begins the symphony of shhhs. So why is this happening and how can we avoid this rising epidemic? It seems some of the documented occurrences have a common denominator. That being the consumption of alcohol. So is a solution to rid Broadway houses of liquor? Of course not. How else will theater capitalize on the consumer? And then there are those people who can’t seem to detach themselves from their cellphones. And the fine folks at AT&T didn’t help the situation. So is a solution to ban cell phones from theaters? Of course not. But maybe you shouldn’t be granted entry until the cell phone is in the up right and off position. And then it’s those talkers. Should a muzzle be given with each ticket purchased? Of course not. Then we can’t sing along to our favorite showtunes. 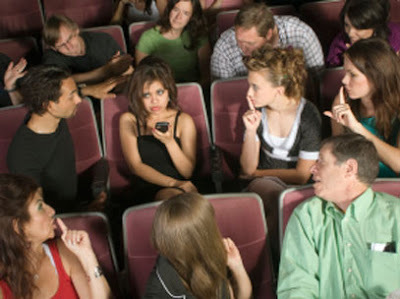 All joking aside, it seems as if theater etiquette has gone down the tubes. And it’s unfortunate. Theater tickets seem to be skyrocketing. With production values becoming astronomical, producers are forced to match the cost of producing a show of worth by upping ticket prices. It used to feel as if theaters were filled with the occasional theater fan alongside the artists who support their peers. Nowadays, you almost need to be well-off to attend a Broadway show. And perhaps the rules of etiquette don’t apply to the privileged. Certainly that’s a generalization and likely not true. But where has the etiquette gone. I feel like the most awful person in the world if I have to cough in the middle of the show. I don’t want to disrupt anybody. But it seems the logic of fear of disruption doesn’t apply to everyone. And it’s a shame. Is it the clientele? Who really knows. Last week, an instance occurred at The King and I involving a young boy having an outburst. The audience instantly turned on the child and mother. As castmember Kevin Moon Loh poetically wrote about the situation on Facebook, we don’t always know the facts and the situation. There are certainly occasions at the theater that goes beyond our control. That happened to be one of them. But the instances that are just plain rude? How do we minimize it? For us artists, we take great pride and joy in sharing our work for an audience. Whether it is for a house of ten or a theater of thousands. It’s our passion that drives us. And all we want is a little respect. And by respecting the people on stage, you’re in turn respecting the patrons around you. Whether you pay $35 for a ticket or $435, we’re all entitled to have the same experience. Remember, you’re not alone. There are people around you. Nytix.com has a nifty 13 rule theater etiquette article. Maybe with every ticket purchased, these rules should be attached. Or maybe it should be common knowledge. It's time to start a conversation so we can all be entertained again.